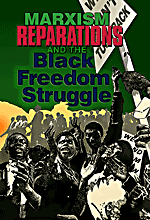 Home » Coast to coast » On heels of DA scandal: Free Mumia Abu-Jamal! 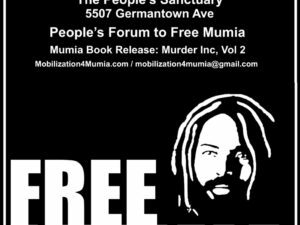 On heels of DA scandal: Free Mumia Abu-Jamal! 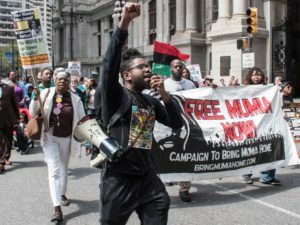 Scores of demonstrators brought afternoon rush-hour traffic in Philadelphia’s Center City to a halt on July 7 as they took to the streets to demand justice for Pennsylvania political prisoner Mumia Abu-Jamal. The hours-long march, with frequent stops for street speak-outs, followed a noon rally outside the Philadelphia district attorney’s office. As the protest snaked its way through busy city streets, it stopped wherever crowds were gathered, including outside busy restaurants where diners sat at sidewalk tables. Speakers took time to explain Abu-Jamal’s case and to link it to the current struggles against racist police brutality and corruption in the DA’s office. Several people, who had stopped to listen to speakers, joined in the march, swelling the protesters’ ranks to nearly 100. 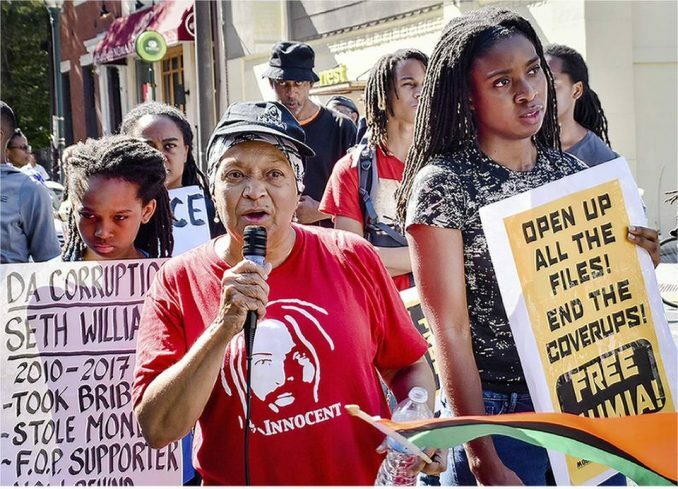 Demonstrators were demanding the DA comply with a Common Pleas Court order, the second in just over a month, to release all files showing the involvement of former DA Ronald Castille in Abu-Jamal’s case. Castille was a senior prosecutor when Abu-Jamal was framed and convicted for the murder of a Philadelphia police officer in 1982. In 1989, he was the DA who argued to uphold Abu-Jamal’s conviction and death sentence. Years later, as a justice on the Pennsylvania Supreme Court, Castille twice refused to recuse himself from hearing Abu-Jamal’s state appeals, ruling against him both times. In June 2016, a landmark U.S. Supreme Court decision, Williams v. Pennsylvania, ruled that judges must remove themselves from any case they had a hand in prosecuting. There are now 14 Pennsylvania prisoners, including Abu-Jamal, who have filed appeals based on the ruling. While the latest court order mandated the release of the files on July 7, protesters learned that a request for a week’s extension was sent by the DA’s office to the court earlier that day. While the office claims it will comply with the judge’s order, there is little reason to trust them, given the history of this case. 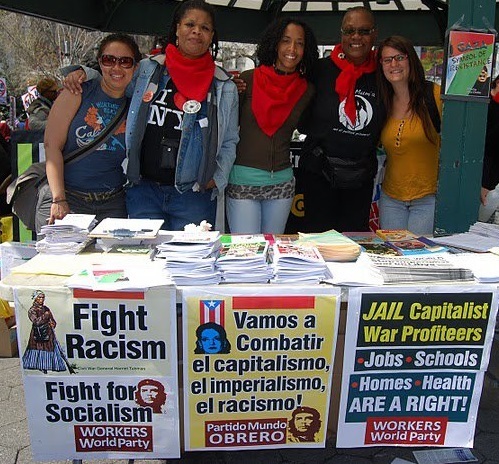 Activists pledged that they will continue taking the struggle to the streets and to the people until Mumia Abu-Jamal is released!